Looking to combine your tech with your play? These four app controlled toys were all tested by The Grommet team and are sure to bring you (or your little ones) hours of fun playtime. 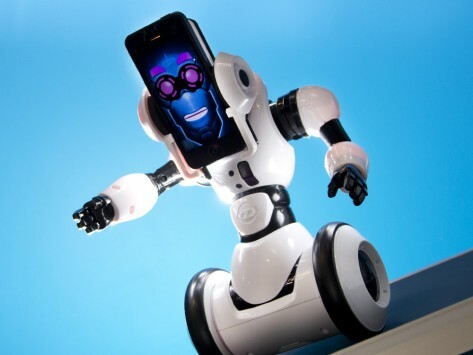 A completely customizable robotic friend that uses the power of your iPhone or iPod touch. RoboMe is able to remotely interact with its environment from anywhere another iPhone or iPad is connected. Shop Now. With the help of your smart device, Ubooly comes to life and gets kids to interact and learn through active play. Ubooly is powered by technology, but it looks and feels like a cuddly companion, not a computer screen. Shop Now. Sphero is a robotic ball you control with your smartphone or tablet. Compatible with over 20 different games and apps. Shop Now. This interactive shape sorter is ideal for children between 18 months and 4 years old. With a soft plastic cover and silicone touch points, the four shapes (circle, square, triangle, star) are durable enough for toddler play and designed for use with iPad screens. Shop Now. Have you spotted other fun app controlled toys? If so, be sure to tell us about them!